Happy New Year! The month of January is always an inspiration for me. Being snow bound allows for creativity in the kitchen, developing new recipes, admiring seed catalogs, and dreaming of spring, and the new planting season! In January, we start planning for the next harvest season in earnest. First, we take an inventory to see what ingredients are still in the cooler and freezer: wild blueberry puree, ruby-red cranberries, tomato puree, peach puree, Chestnut and Famuese apples, eggplant, leeks, roasted red peppers, and more. Then we have lots of discussions about what products to bring to market, and evaluate the feedback from our shareholders. Flip, our chief Finance person, is charged with the task of determining what products are profitable to bring to market, and therein lays the key: profitability. To rebuild a sustainable food system, all parties involved, farmers, workers, distributors, and processors need to make a fair living and be profitable. Because we are determined to create a company that provides value chains, we work with everyone along the value chain to ensure profitability. When the consumer purchases our product, they are paying the true cost of local, organic food. Some folks think we started this company to feed our family…and in many ways we did, the entire Maine family. Thanks to you, we are putting more Maine food on Maine plates every day. Thanks for supporting “our family” and Maine agriculture! Pickled Green Strawberries: Back in June, Marada Cook of Crown of Maine Distributors convinced me that Pickled Green Strawberries were the latest ingredient trend…seems that restaurant folks like the French Laundry in California were serving them on a butter-poached lobster, David Chang on PBS enjoyed them over fresh sea scallops, and they were even showing up in cocktails and garnishing white sangria. If our company were to make a significant enough of a purchase, several Maine chefs would also be able to start working with them. So, I bought it, hook, line and sinker…and here they are. Try them…and let us know, honestly, if Maine is trendy enough for Pickled Green Strawberries! Aroostook Biscuit Mix: Aroostook County is the breadbasket of the Northeast, and I am determined to get more folks to eat more whole grains. This biscuit mix is extremely versatile, and easy to use…think Bisquick, only from way up North. Want some cheesy biscuits? Before baking, brush the tops with melted butter and sprinkle with Parmesan cheese. Need a heartier flavor? Try making them with bacon fat and serving them up hot for breakfast. For some Maine families, the best old-fashioned way to enjoy your biscuits is dripping with molasses or apple cider syrup. How was the flavor and texture of the Pickled Green Strawberries? How did you use the product? Are trendy ingredients of interest to your family? For our long-term shareholders, you may recognize Organic Maine Apple Ketchup as Wild Apple Grill Sauce…same product, different name. We are researching a line of fruit ketchups for larger retail markets. Does this have appeal for your family? How about the jar size? We changed to a wider-mouthed jar. Would an 8-ounce jar be a better family size for this product? Speaking of jar size, the Roasted Red Pepper Sauce comes to you in a 12-ounce jar. 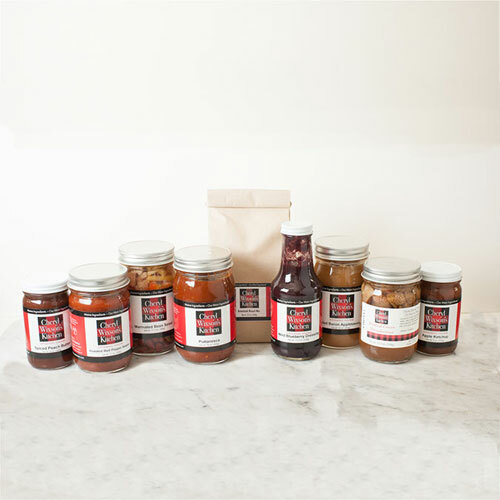 Because our products do not use preservatives or additives, we strive to provide appropriate amounts that the consumer, once the jar is opened, will use before spoiling. Is this a good size? How about a 16-ounce jar size? Our preserves and jams continue to be good sellers, but our new labels don’t fit on the jam jars. We will be switching to a new, straight-sided jar this year, that will not be a standard canning jar size. Is the 8-ounce quantity of the jar a good value? Do mason jars appeal to your family for reuse, or is this not a priority? 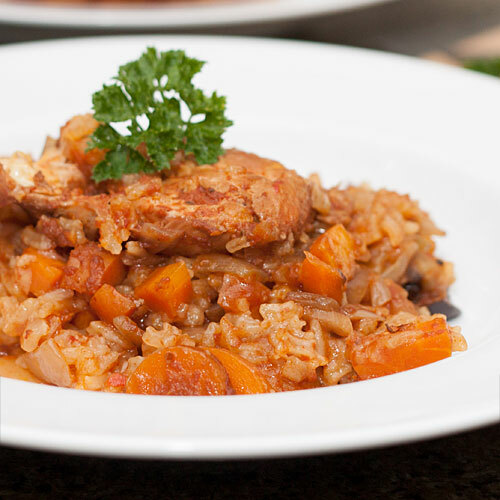 This is a riff on a classic Puerto Rican stew/paella. The savory stew is rich in flavor. Set on high, and cook until the chicken pieces are done and the vegetables are tender. About 1 hour before serving, add one cup of brown rice and cook until done. One serving of this delicious dish provides over 30% RDA of Vitamin C, and almost 3.5 grams of fiber. In a large skillet with a cover, heat the olive oil and add the onion slices. Sauté until just soft, about 5 minutes. Add the Roasted Red Pepper Sauce and bring to a simmer. Stir in the green beans, covering them with the sauce. Put the lid on the pan and cook until the beans are tender. Serve hot or cold. Garnish by sprinkling with chopped fresh rosemary. Makes 6 servings. Nutritional analysis per serving: 57 calories, 3 grams protein, 9 grams carbohydrates, 2 grams fat, (0 grams trans fat), 137 mg. sodium, 3 grams fiber. 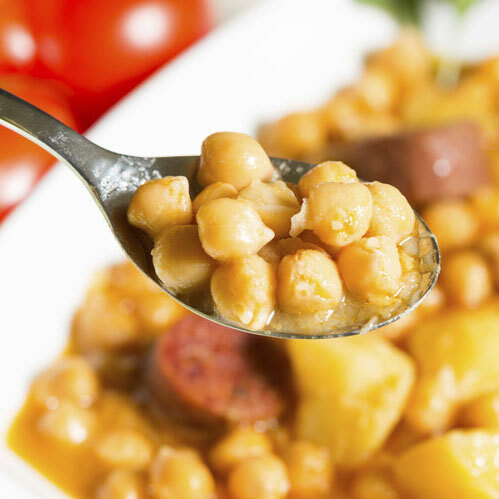 This hearty, Mediterranean inspired stew is prepared from just 4 ingredients. Serve with Perfect Popovers and lots of jam! Heat a heavy soup pot. Remove the casing from the sausage, crumble into the pot, and cook until just about done and the fat is rendered. Add the chopped leeks, and cook, stirring until the leeks start to soften, about 5 minutes. Add the Puttanesca Pizza & Pasta Sauce. Rinse out the jar with water, and add the 2 cups water. Bring to a simmer and cook, covered, for 15 minutes. Stir in the spinach and cook until wilted, about 5 minutes. Season to taste with sea salt and fresh pepper. Ladle into soup bowls and serve. Makes six servings. Nutritional analysis per serving: 244 calories, 11 grams protein, 31 grams carbohydrates, 8.4 grams fat, (0 grams trans fat), 482 mg. sodium, 8.6 grams fiber. In a medium bowl, gently combine the orange, kiwi, red onion or sliced scallion with the drained pickled strawberries. Add just enough brine to marinate, about 2 tablespoons. Wash the scallops and remove the muscle. Marinate in the strawberry brine for at least one hour or overnight. Grill over medium-high heat until just cooked. Serve with Winter Fruit Salsa. To prepare, line the salad bowl with the greens. Arrange Winter Fruit Salsa on top. Sprinkle with Feta Cheese and drizzle with brine. Add toasted almonds if desired. Scrub potatoes. Cut into wedges. Soak in a bowl of water. Dry with paper towels. Toss with olive oil and roast on a baking sheet in a 400-degree oven, turning as needed. Serve with Organic Maine Apple Ketchup. Preheat the oven to 400 degrees. Peel and cut the apples. Sauté briefly in one tablespoon of butter over medium heat. Stir in the Spiced Peach Butter and bring to a simmer. Turn off the heat and let cool. Roll out the puff pastry on a well-floured surface. Cut into six rounds, each about 4 to 5 inches in diameter. Divide the apple mixture between the puff pastry rounds. Gently turn up the edges, squeezing together as necessary to hold the filling in place and form a tart. 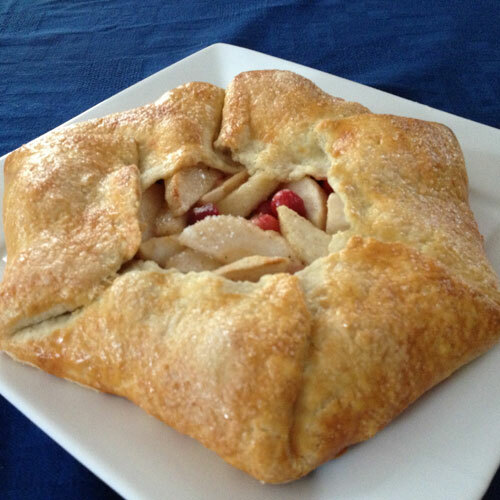 Place on a cookie pan and bake until the puff pastry is golden brown, about 15 – 20 minutes. Serve warm or at room temperature. Makes six tarts. Nutritional analysis per tart: 386 calories, 4 grams protein, 49 grams carbohydrates, 20 grams fat, (0 grams trans fat), 139 mg. sodium, 3 grams fiber. Combine ingredients in the bowl of your slow cooker. If necessary, add just enough water to cover. Cook on low heat for 8 – 9 hours until tender.